In 2013, I launched and successfully funded a painting project on Kickstarter.com to change medical environments. The inspiration for my "LandEscape" series came from an experience I had while working as an Artist in Residence on the oncology floor at Women’s & Children’s Hospital of Buffalo. It was a sunny Spring morning when I walked into a young patient’s room and said, “What a beautiful day it is outside.” The patient looked up at me from bed and said “It always looks the same from here.” That comment sparked an idea and started me on my mission to change medical environments and give every patient a room with a view. The series depict views of sunny landscapes. They include roads and paths to draw the viewer in, and the canvas is collaged with positive messages and words of encouragement. Working with patients, I learned how much people enjoyed watching the creative process and a blank canvas coming to life so I captured my painting sessions using time lapse photography. A digital photo frame hung next to a painting, playing sound effects of the imaginary landscape, can offer the viewer an escape from the hospital setting. 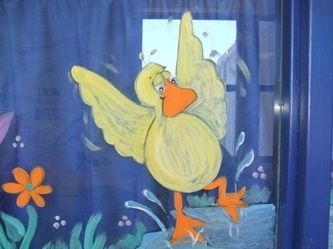 One of my favorite jobs at Children's hospital was painting the playroom windows. I changed the images seasonally but the paintings all shared a consistent theme, kindness, peace and love. A friend suggested that I capture the images on canvas. The "Virtues" Painting series below were inspired by those hospital windows. Follow my daily sketchbook on Instagram! "Within each of us there lies a secret garden, a place where our creativity blossoms. It's a meditative space, where the only limitation, is one's own imagination."